A pull-up jumper by Kendale McCullou with less than three seconds remaining on the clock gave the No. 24 Lewis Flyers a 63-62 victory over No. 9 Bellarmine as Lewis pulled off the upset to spoil senior day for the Knights in a Great Lakes Valley Conference game on Saturday in Knights Hall. After the visiting Flyers controlled the first half and took a 29-21 advantage at the break, Bellarmine fought back and snatched a second half lead, only to see Lewis respond and hold on for the win. Following a lengthy video review, Bellarmine was awarded possession with less than 10 seconds remaining. Daniel Ramser took a pass from Adam Eberhard and converted a lay-up with 8.6 seconds remaining. McCullum then took the inbound pass and drove to the other end to make the eventual game-winner. Bellarmine made just 30 percent of its first half field goal attempts and fell behind by as many as 15 as Lewis took an 8-point halftime advantage. The Knights battled back to and took a five-point lead in the second period, but the visiting Flyers responded and pulled out the victory. The final stats show Adam Pischke of Lewis as the leading scorer. The 5-10 junior guard was effective all over the floor, making four of six triples and converting on a number of drives to the basket to lead all scorers with 24 points. McCullum added 12 for the Flyers while Bellarmine was led by Chivarsky Corbett’s 16 points and nine rebounds. Daniel Ramser was the only other double digit scorer for Bellarmine with 10 while Adam Eberhard scored six and added nine assists and six rebounds. With the victory, Lewis claims the lead in the GLVC after improving to 20-4 and 13-3 in conference play. The Knights fall to second in the standings at 21-4, 13-4 GLVC. 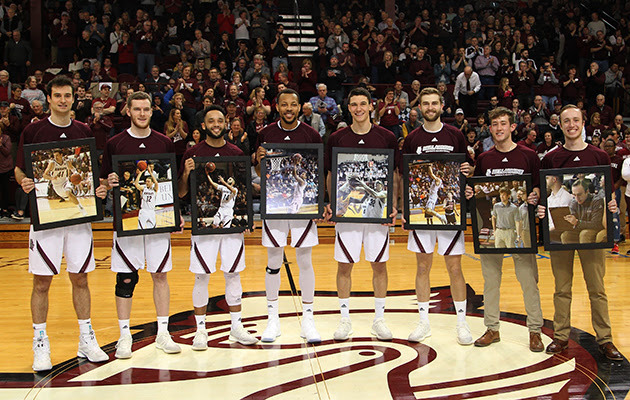 Prior to the game, Bellarmine held senior day ceremonies to honor six senior players: Eberhard, Corbett, Ramser, Tyler Jenkins, Willie Schurfanz, and Skyler Hunter along with managers Joe Simon and Ben Thompson. The Knights conclude their 2018-19 regular season with road games at McKendree and Illinois-Springfield on Thursday and Saturday.